single-crystal orientations found at the surface of pc ZnS: 100, 110, 111, and 311. The (111) plane is 35% to 55% harder and 30% to 40% more resistant to chemical etching than the other three planes. 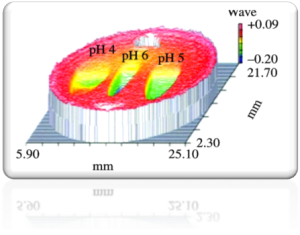 This high degree of variation in these properties helps to explain the surface texture developed from MRF of the polycrystalline material. 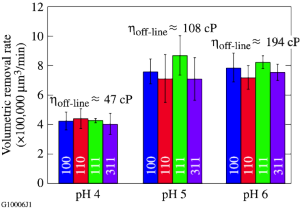 Surface characterization of these single-crystal orientations of ZnS for material removal and roughness with chemically modified MR fluids at various pH levels between pH 4 and pH 6 are presented for the first time. These results will guide the development of new acid MR fluids for polishing pc CVD ZnS.